Joel Billings is in trouble…again. After being threatened by his jailbird father, Joel is packed off to a sleepy beachside town for a holiday with his biker foster dad, Dev. Only when a monster ute runs them off the road does Joel begin to suspect that all is not as it seems. 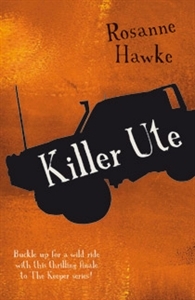 Who is driving the killer ute? And why are they after Joel? As danger mounts, Joel and Dev are forced further into hiding. But a killer ute isn’t all Joel has to fear. Will Dev still want to be his dad even though he’s a magnet for trouble? This exhilarating action-adventure is the third and final in a trilogy for middle-reader boys, which began with The Keeper and Sailmaker.